Who we are and what are our objectives? Kaszëbskô Jednota is an association of people who want to actively participate in the life of the Kashubian nation and who recognize its right to cultural autonomy and self-identity within the multi-ethnic society, which constitutes uniform state of the Republic of Poland. Our aim is to develop national, civic and cultural consciousness of Kashubians, protection of their language, traditions, as well as scientific and educational activity for the benefit and development of local communities, national and ethnic minorities using regional language. Over the centuries, rivalry between the Polish and German nations and states saw Kashubians being the subject of constant Germanization and Polonization. However, this did not stop the development of our mother tongue, nor did it tear our ties rooted in the cultural heritage of the Western Slavs of Baltic basin and Western Europe. Despite this, the process of assimilation does not weaken. Kashubians undergo polonization, letting their identity to be just symbolic, usually triggered only in conjunction with the language identification and the place of birth, or even completely disappearing among younger generations. Unfortunately, such situation is being fostered by flawed policy adopted by some Kashubian elites believing that demanding full rights enjoyed by other minorities in Poland will lead to their socio-economic exclusion. Therefore, these elites are eager to point out what Kashubians should identify with, while at the same time devaluing, or even inhibiting processes increasing ethnic awareness of the members of our community. This deliberate message clearly encourages further loss of national identity amongst Kashubians. We do not want to be losing our identity in a democratic state. Instead, within its framework, we want to achieve our full rights as a culturally distinct and autonomous nation. We believe that friendship among Kashubian and Polish nations, built on mutual understanding will last, and it may be a prime example of the democratic community aspiring to be a leader in the European Community. Our actions are based on social solidarity, communal dialogue and respect for freedom and justice. We promote citizen's participation in public, social and economic life. We are particularly interested in those who realize their aspirations in local communities and are interested in comprehensive development of Pomerania region. We strive to promote good attitude and values among young people. We promote openness, innovation, diligence and professionalism. We stand for strong self-governing regions and we will promote decentralization as a way of ruling the country. Our goal is the development of Pomerania, as a multicultural region with significant socio-economic potential, able to protect social and individual energy resources of all its inhabitants. The next generations of Kashubians have the right to education based on their own language, history and geography. We will endeavour, as soon as possible, to incorporate Kashubian history and geography into the school curriculum. In the future, we assume the introduction of mandatory language, history and geography of the Kashubia into the educational process in Pomerania. 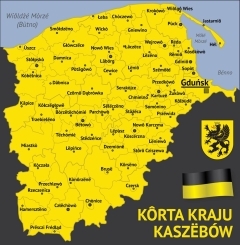 Kashubian language, alongside Polish, is a full-fledged language in Pomerania region. "Strategy development of the Kashubian language and culture" assumes "making the Kashubian language capable of continuity and further development." We support this goal and declare our involvement in implementing the "Strategy ..." in all areas described in it. As a nation we have many reasons to be proud and the right to be respected. We draw from history to the present what is most important for our identity and what has got the deciding impact on our sense of community. Our national emblem is a crowned black griffin. Kashubian national flag is black and yellow, which is associated with our coat of arms, which is a crowned black griffin facing to the right on the yellow escutcheon. Our capital is the city of Gdańsk, which is the centre of the economic and socio-cultural region. The song by Jan Trepczyk "Zemia Rodnô", describing the historical greatness of Kashubia, is our national anthem. Kaszëbskô Jednota Day is the 19th of March, which we consider to be our national holiday commemorating the first historical record confirming the very existence of Kashubians in the papal bull of Gregory IX, dated March 19th of 1238. If you agree with this declaration, we invite you to work with us in the Kaszëbskô Jednota Association. More detailed information about becoming a member and how to contact us can be found on our website.